Acclaimed theatre company The Wardrobe Ensemble, in co-production with Royal & Derngate, Northampton and Shoreditch Town Hall, will bring The Scotsman Fringe First Award and The Stage Edinburgh Award-winning, smash-hit production Education, Education, Education to London’s West End this summer. The iPhone doesn’t exist, no one knows who Harry Potter is, Titanic is on the shelves of every Blockbuster and we have just won Eurovision. Britain is the coolest place in the world. At the local secondary school it’s a different story. It’s the last week of term and Tobias, the new German language assistant has just arrived in the UK. While political change occurs outside of the classroom, a revolution slowly starts to take place within it. Tobias is greeted by a group of eccentric schoolteachers just trying to make it through the day, including Miss Belltop-Doyle who can’t control her year 10s and Mr Pashley who is trying to keep a confiscated Tamagotchi alive. This whip-smart show is a love letter to education in the 90s and is jam-packed with more hits than ‘Now That’s What I Call 1997’ including Oasis, Katrina and the Waves, The Spice Girls. Crammed with Teletubbies references, jokes about Take That and the Macarena, Education, Education, Education plays a strictly limited 4 week season at the Trafalgar Studios. The Wardrobe Ensemble uses its singular style of irreverent humour and inventive theatricality to dissect education and responsibility at the dawn of Blair’s Britain in 1997. In Education, Education, Education audiences are thrown back to the 90s; the music, the fads and the icons as well as issues that remain pertinent to the twenty-first century experience. The cast of Education, Education, Education will include: Tom Brennan (Paul McIntyre), Ben Vardy (Tim Pashley), Jesse Meadows (Susan Belltop-Doyle), Emily Greenslade (Emily Greenslade), James Newton (Tobias) and Tom England (Hugh Mills). Education, Education, Education has been devised by The Wardrobe Ensemble and directed by Jesse Jones and Helena Middleton. Further casting will be announced in due course. 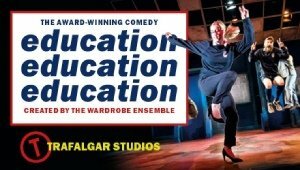 ​Education, Education, Education is a co-production between The Wardrobe Ensemble, Royal & Derngate, Northampton, and Shoreditch Town Hall, presented in the West End by Trafalgar Theatre Productions and Eilene Davidson.